An outstanding hockey player, Frederick Wellington Taylor (1884-1979) was born in Tara and began his amateur career with the Listowel juniors c. 1901. His exceptional skating ability and irrepressible energy drew widespread attention to "Whirlwind" (later nicknamed "Cyclone") Taylor. In 1905 in Michigan, Taylor entered the International League, hockey's first professional organization. Having joined the Canadian civil service in 1907, he continued to play with the Ottawa and Renfrew teams and soon confirmed his reputation as a brilliant all-round player. He concluded his celebrated hockey career with the Vancouver Millionaires of the Pacific Coast Hockey Association, playing with them from 1912-20. In 1946, he received the Order of the British Empire for his service to the immigration department. 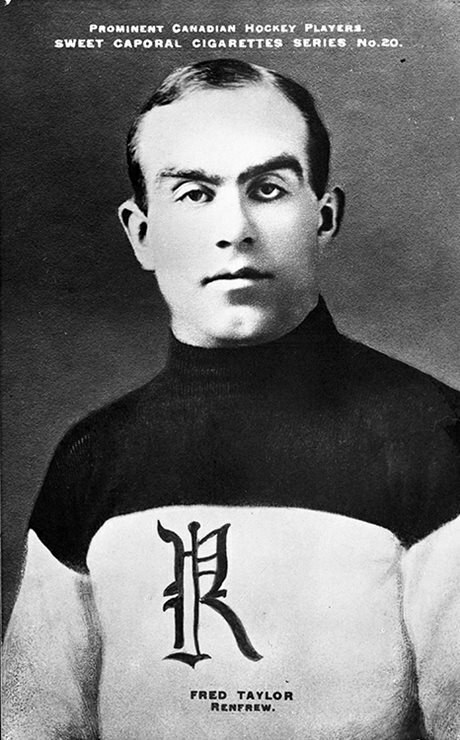 "Cyclone" Taylor was inducted into the Hockey Hall of Fame in 1947. Visit the Ontario Heritage Trust provincial plaque at Memorial Park in Tara, Ontario, bounded by Main and Ann streets and Yonge Street South. See artifacts at the Hockey Hall of Fame’s website.